St. John the Baptist Greek Orthodox Church is pleased to offer this year, for the first time, a three day retreat that will include the opportunity to worship together in celebrating the Divine Liturgy! Our speaker will be Fr. Theodore Dorrance. 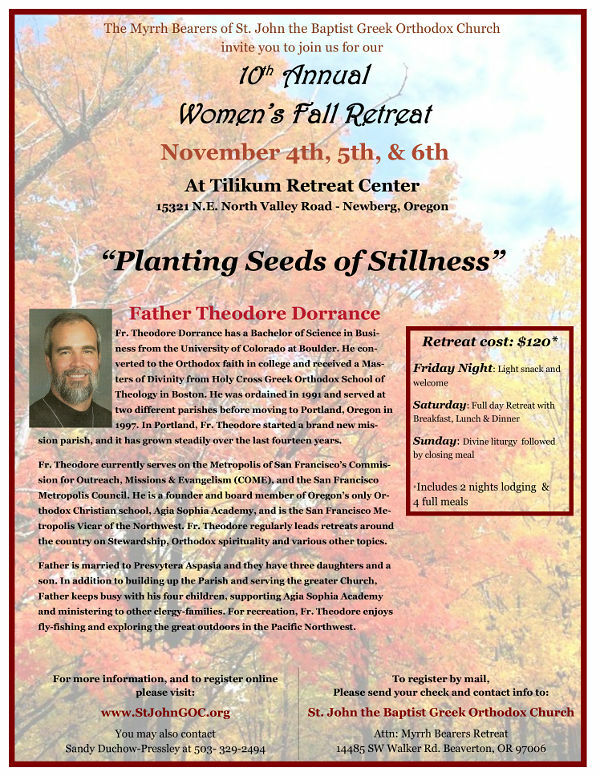 The retreat is being held at the beautiful Tilikum Retreat Center in Newberg, Oregon. Cost: $120 which covers two nights lodging and 4 full meals. Register online. This entry was posted in retreats and tagged fall, Fr Theodore Dorrance, retreat, St. John the Baptist, women. Bookmark the permalink.